Home/Auto Headliner Faqs/General headliner questions/I have a 2007 Audi a4. The headliner is frayed along the drivers-side door edge. I have a 2007 Audi a4. The headliner is moderately frayed along the drivers-side door edge. The rest of the headliner is is great shape. Is there any product I can use to repair this fraying and protect from further damage? Is there something I can use to reinforce/cover the fabric that will look nicely finished? Ripped headiner fabric doesn't repair easily, nor usually does it repair pretty. 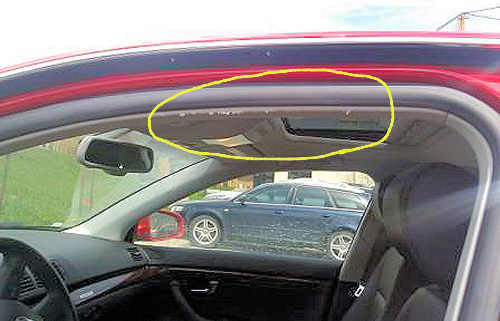 About the only thing we can think to do with that type of damage is to use specs of glue on the under side (the foam of the headliner) of the snags and press it down to glue it. Do each individual snag like this - don't press it down hard - just lay it back down. It should be at the least; presentable. A type of glue like crazy glue may work for you - just don't use to much glue so that it will saturate the cloth part of the headliner. It just needs to be tacked down. If you can find some type of clear glue, it will work better. It really doesn't have to be that strong, just strong enough to tack it down. The small to mid sized kit will work for the 2007 Audi A4 car.